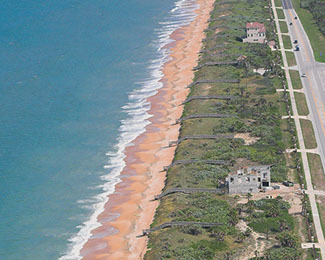 Established in 2001, Carino la Mer, the southernmost oceanfront sub-neighborhood at Hammock Dunes, consists of 28 lots located between the Atlantic Ocean and State Route A1A. 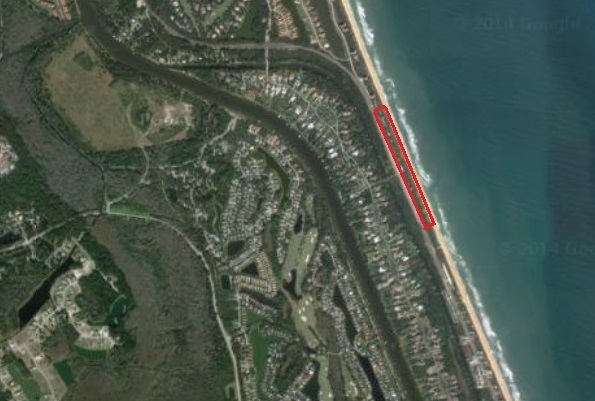 These properties are clustered into nine groups of three lots sharing a common entry from A1A, plus one lot sharing an entry with a Hammock Dunes common property for beach activities. Each of the 28 lots is 100 feet wide with setbacks allowing a 60-foot wide house to be constructed, all with dune walkovers to the coquina sand beach. By 2004, all lots were quickly sold by the Developer. Just in back of the individual lots, the Hammock Dunes Community owns the dune down to the mean-high-water line and maintains and protects this area for uniformity and the vitality of the vegetation. The walkovers are also maintained as common property. Three oceanfront residences have been built in Carino la Mer, complying with strengthened 2003 (or more recent) building codes. Homes built to current code are much easier to insure at reasonable rates. 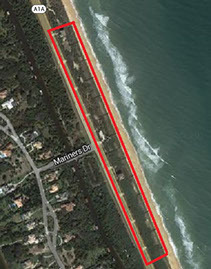 Purchasing oceanfront houses outside Hammock Dunes built before the year 2003 subjects the buyer to lower construction standards. The minimum house size is 3,500 sq. ft., but the two existing houses exceed this requirement. Houses usually have three floors, not counting the garage level. All Carino la Mer lots are located east of the Coastal Construction Control Line (CCCL) and require auger-cast piling foundations per the requirements of the Florida Department of Environmental Protection (FL-DEP) through their permitting. The lots require analysis of core drilled soil samples by a geotechnical engineer and a structural engineer for foundation design. The Hammock Dunes “Design Review Committee” can provide information on all building requirements. Excluding the cost of the lot, property owners should anticipate spending between $2.4 million and $3.0 million in carrying costs, design, permitting, and construction of their homes, and over three years before completion. 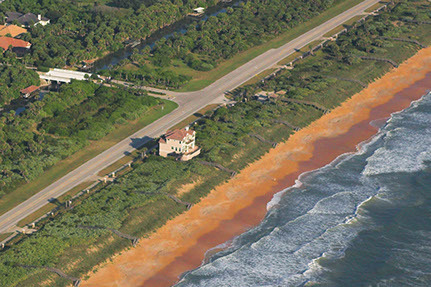 As compared to many other sites in Florida, these costs are very attractive for an oceanfront residence. As Carino la Mer is less than 10% built, there remain many opportunities for lot purchase and construction of Mediterranean-style homes with up-to-date materials and designs. Adjacent lots may be combined to build a larger residence if desired. Come experience the joys of oceanfront living with lines of passing pelicans, ospreys diving for fish, dolphins cresting, and even whale watching. Combined, Carino la Mer and its northern sub-neighborhood of Playa del Sur form a stretch of 1.3 miles of Atlantic oceanfront properties all within Hammock Dunes. This is unique in Florida and will offer a truly outstanding lineup of 71 beautiful homes on the Atlantic when completed.